Mehrabi, K., Rahimipour, M., Shokuhfar, A. (2005). The Effect of Slag Types and Melting Rate on Electro-Slag Remelting (ESR) Processing. International Journal of Iron & Steel Society of Iran, 2(1), 37-42. K. Mehrabi; M. R. Rahimipour; A. Shokuhfar. "The Effect of Slag Types and Melting Rate on Electro-Slag Remelting (ESR) Processing". 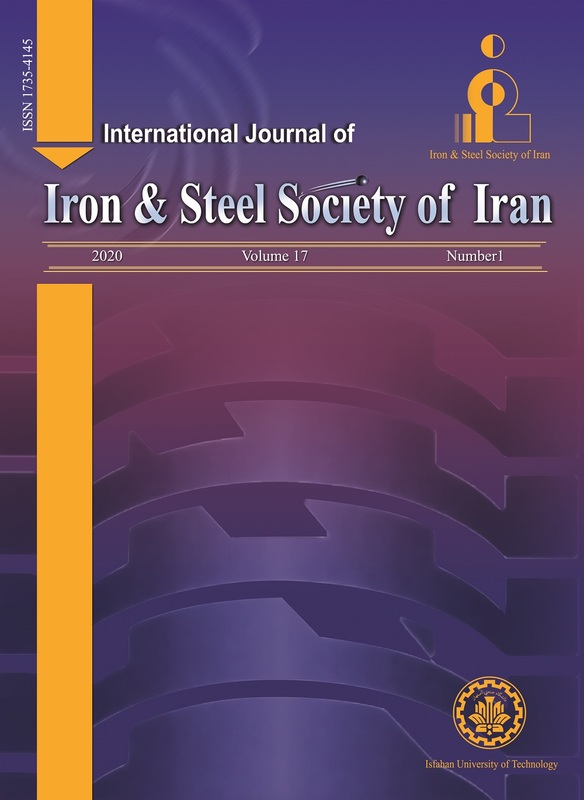 International Journal of Iron & Steel Society of Iran, 2, 1, 2005, 37-42. Mehrabi, K., Rahimipour, M., Shokuhfar, A. (2005). 'The Effect of Slag Types and Melting Rate on Electro-Slag Remelting (ESR) Processing', International Journal of Iron & Steel Society of Iran, 2(1), pp. 37-42. Mehrabi, K., Rahimipour, M., Shokuhfar, A. The Effect of Slag Types and Melting Rate on Electro-Slag Remelting (ESR) Processing. International Journal of Iron & Steel Society of Iran, 2005; 2(1): 37-42. In this research, the influence of chemical composition of slags and the melting rate on the impurity of commercial grade iron in ESR processing has been investigated.The chemical composition and microstructure studies were evaluated, using spectrophotometer,OMand EDX analyses attached to SEM.The results show that ESR process has successfully reduced the amount and size of inclusions. In some cases, sulfide inclusions were not observed and the size of other inclusions was reduced down to 10 , whereas in primary electrodes the size of inclusion was up to 100 . An increase in the slag basicity up to a critical point and a decrease in the melting rate caused better desulfurization ability of the slags. However, the increase in the time of process was governed by the melt temperature and fluidity. Paton, B.E., Shaped Electro Slag Casting, Proc. Of 4th Int. symp. on ESR, Japan Iron and Steel Institute, (1973), 209. Choudhury, A., Vacuum Metallurgy - Remelting Process, ASM, 1990 (75). Mueller Aue, H.J., Hengerer, D. & Holz gruber, W., The Development and Application of the Electro Slag Remelting Process (ESR) in the Western Countries, Institute of Metal, 33 (1980), 85. Hoyle, G., Electro slag Processes, Principles and Practice, Electro Slag Refining Technology, British Iron and Steel Research Association, Applied Science Publishers, London & New York, (1982), 65. Bonneviate, B. & Meichsner, W., Optimization of Secondary Metallurgy, Metallurgy Specialist, (1998), 37. Chernov, V.P. & Roshchin, V.E., Method of Slag Desulfurization, Patent No. RU2164954, (2001). Bertram, L. & Mimsandram, R., Vacuum Arc Remelting and Electroslag Remelting, Marcel Dekker Inc., (2002), 565. Alex, K. & Evgueni, J., Viscosity model for the Al2O3-CaO-FeO-SiO2 system, Elsevier Science Ltd., (2001).